Sanrio character Gudetama is Japan's favorite lazy egg, and he can be found on all kinds of bizarre merchandise, from soup spoons to screen cleaners. But the beloved cartoon hasn't officially been edible—until now. At a new Gudetama-themed pop-up shop in Hong Kong, diners can enjoy a number of egg-based dishes boasting the breakfast mascot's anguished face. In the mood for something heartier? There's also ramen and Dim Sum. 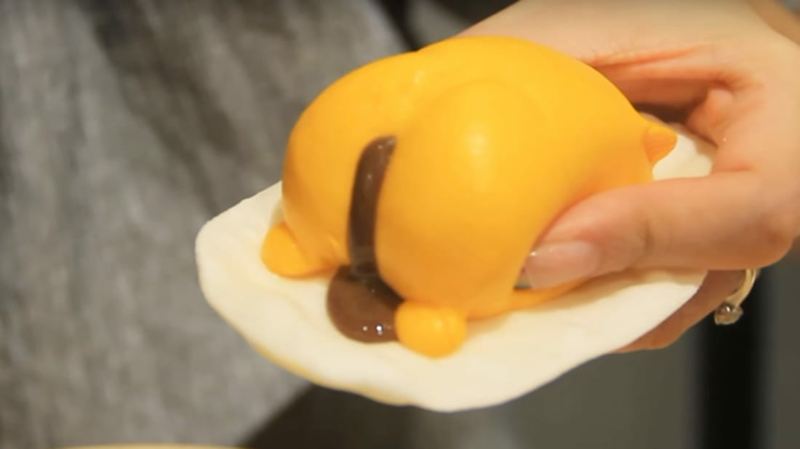 If the idea of eating a cartoon doesn't bother you, the café's custard buns might: When you stab the mouth or rear end of your Gudetama pastry with a chopstick, it will vomit or defecate accordingly. The weird egg cafe debuted October 4 in Hong Kong's YATA grocery store. Along with the themed dishes and incontinent desserts, there are also plush toys, balloons, and wallpaper all sporting the lazy egg's face.